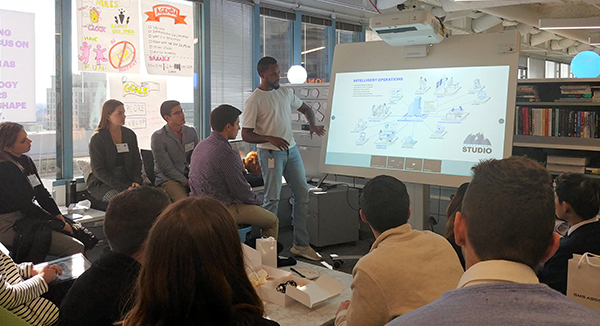 While at Accenture, students gained an inside look at how the digital hub of Accenture operates. A trip to the Windy City proved worthwhile for 19 University of Nebraska–Lincoln students who embarked on a career expedition hosted by the Business Career Center, October 14-16. The students visited different industries and took in sights of Chicago. Staff sponsors included Dr. Chris Timm, associate director of employer experience and outreach, and Micah Lindblad, career coach. Timm explained how the growing number of Nebraska Business students from the Chicago area, as well as a growing interest by students in the Chicago job market, necessitated the trip to build and strengthen relationships with employers in the area. Starting with a welcome dinner with alumni and young professionals talking about living in the city and their careers, the trip also allowed students to visit numerous employers. They included Accenture, Aon, Jellyvision, Mizuho Americas and SMS Assist and students learned about different careers and networking with potential employers. The 19 Nebraska Business students who went on the expedition took a moment to admire Cloud Gate at Millennium Park. In their free time, students also explored the city, going to key attractions such as Cloud Gate at Millennium Park and the Willis Tower Skydeck. As a graduate student at the college, Kenneth Chong, noticed the distinct culture at each site. They created unique environments for their employees through dress codes or stress-relieving areas, such as nap rooms. The spring career expedition will take students to San Francisco March 17-20. To apply, visit: https://business.unl.edu/careerexpedition.